One of the things that has most surprised me about motherhood is the way that my childrens' interests have become my interests as well. I'd have thought that, as the parent, my interests and preferences would rub off on the boys and not the other way around. But surprise! The boys don't give one flying whoopie doo about writing a novel, and I have become obsessed with trains. A couple of weeks ago, I came across a teeny tiny notice in the local paper that said the Canadian Pacific Holiday Train would be making a stop in Delanson, NY. I'd never heard of the Canadian Pacific Holiday Train and didn't know where Delanson was, but it sounded cool. So I tore that page out of the paper and stuck it to the fridge to research later. I found the Canadian Pacific Holiday Train Facebook page and double checked the times and locations. 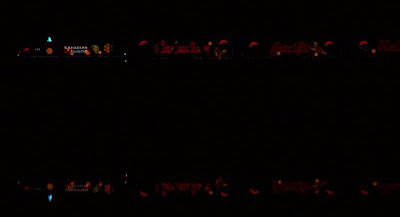 I also learned that the train is a Canadian Pacific freight train decorated all over with lights, and that it makes stops at various places throught Canada and the Northeastern US. There is a live band onboard that performs Christmas music from a boxcar stage, and at each stop food and monetary donations are collected for that town's community food bank. How cool is that? It turned out that in addition to the stop in Delanson (27 minutes to the west of us), the train was actually going to make a stop across the bridge from Scotia (about 3 minutes from us). But since the train was arriving in Delanson at 8pm, and wasn't scheduled to be in Schenectady until 9:30pm, we opted to make the drive to Delanson because the boys (who at 4 and 2 were already up past their bedtime) would be able to stay awake for that show. It was AWESOME! Pictures just don't do the Canadian Pacific Holiday Train justice. Freight trains are massive, and once you're standing up close to one, and seeing the thousands of lights, it is train nirvana, plain and simple. The boys loved the lit up train, (and four-year-old Sam, who was initially terrified of standing so close to the tracks and hearing the train horn so close, pronounced the whole experience "not scary"). A holiday-decorated freight train was cool enough, but when the train stopped, the box car doors slid open, and suddenly there was a band standing on a stage. That was even cooler still. All of us enjoyed the Christmas concert courtesy of Melanie Doane. The music was fantastic and we weren't the only ones dancing in the crowd. Santa Claus came onstage and rocked out with the band, then came out into the crowd to pass out candy canes. When the train pulled away, he stood and waved from the rear platform. Train+lights+Christmas music+ Santa= two very happy little boys and two even happier parents. For the train obsessed (ie. us), it was the perfect start to our first fun-filled NY Christmas. I wish I had gotten some pictures of the train in Delanson. Unfortunately, from our vantage point next to the gigantic boxcars, it was impossible to get a good picture of the entire train. Not to mention, my camera takes crappy night pictures. On the way home, both boys fell asleep, but since chasing trains is so ingrained in our natures now, Tom and I decided to swing by the marina across the Mohawk river from the stop in Schenectady and see if we could watch the train pulling in. It was already on Maxon Rd. when we arrived, but as luck would have it, the front portion of the train was sitting on the bridge that spans the river, just begging to be photographed. This picture doesn't come even a little bit close to doing the train justice. It was really spectacular in person. A dozen other cars were also parked at the marina, looking at the lights, and enjoying the concert (we could hear it really well). The man in the car next to ours said he's been driving over Freeman's Bridge, minding his own business, when he saw the train and had to stop. He wondered how I'd heard about it. I didn't describe the level of train-obsessedness at our house, or the way that I now point like a bird dog whenever I hear or see a train, and start to salavate like Pavlov's dog at the words "train show" and "railroad museum," I just said I'd spotted it in the paper (and considering the size of the font, this was no small miracle). I really wish more people were aware of the train and that the media made a bigger deal out of it. (I did see some articles about it in the paper, but they were all after the fact, which doesn't help the local food pantries this year.) Canadian Pacific is really doing a wonderful thing here, and really should be commended and supported for this (obvious) labor of love on their parts. I'm very glad we found out about and got to experience this firsthand. Going to see the Holiday Train will be our new family tradition, and is reason #1,465,735 that I love living in NY. Glad to hear you heard about and enjoyed our CP Holiday Train! We'll broadcast updates when next year's schedule comes out in the fall. I'm a train fanatic, too. I ride Amtrak so frequently that I'm on a first-name basis with the conductors and crew. Maybe one of these days I'll get to see one decorated for Christmas!